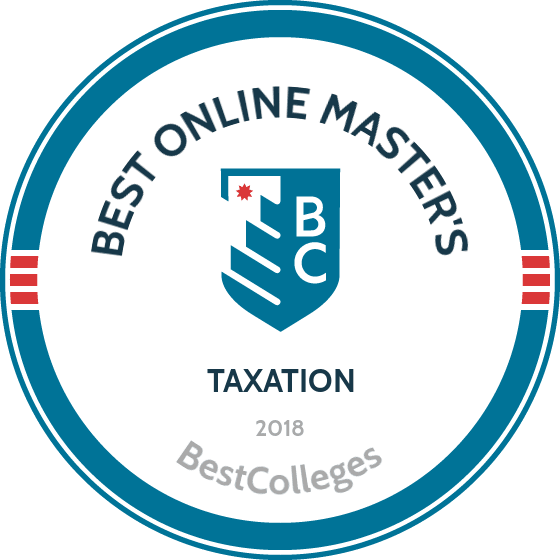 What Are The Best Online Master's in Taxation Programs? What Else Can I Expect From an Online Master's in Taxation Program? Accounting is one of the most stable disciplines around and also includes a variety of lucrative career paths. The National Taxpayers Union Foundation found that Americans spend approximately six billion hours per year complying with federal tax code and they often end up turning to taxation professionals for assistance. The life of a tax professional isn't always a boring desk job. In fact, approximately 15% of FBI employees qualify as special agent accountants. Regardless of your chosen path, a master's in taxation online can lead to a variety of rewarding positions. Yes. A bachelor's degree allows graduates to work in managerial accounting, although it does not meet the requirements needed for a Certified Public Accountant (CPA) designation or for advanced taxation roles. An online master's in taxation also opens the doors for a variety of executive and advanced roles that are not available to those without an advanced degree. The majority of master's in taxation online programs do not require students to have previous work experience, but they may need to have taken a few prerequisite courses in accounting or a related subject. Students must also submit GMAT scores to be considered. CAN I WORK WHILE I COMPLETE MY ONLINE MASTER'S in TAXATION? Yes, many degree seekers continue to work while completing their online master's in taxation. However, they need to have excellent self-discipline and time management skills to be successful students. Classes typically require 10-15 hours of work per week to complete assignments, listen to lectures, and interact with students and professors. WHAT ARE THE ADVANTAGES TO EARNING MY M.X. ONLINE? Earning an online master's in taxation provides all the same benefits of an on-campus program while allowing students to advance their educations from anywhere and on their own schedule. Distance learners also have the opportunity to build their professional networks by connecting with their fellow students. Northeastern offers a part-time MS in taxation that is ideal for tax professionals who want to stay current in the field and master the competencies of top tax experts. The program incorporates theoretic knowledge with case studies delivered by expert faculty at the AACSB-accredited D’Amore-McKim School of Business. This 30-credit online master's in taxation includes coursework on a variety of topics, including federal tax issues, corporations, and shareholders, partners and partnerships, and estate and gift taxations. Students can choose from one of two tracks: taxation of entities or taxation of individuals. This program can be completed in 16 months of part-time study. Online courses are delivered asynchronously, allowing students to complete coursework at their own pace. Applicants must have a bachelor's degree with a minimum GPA of 3.25, complete a course in taxation with a minimum GPA of 3.0, and have at least two years of tax preparation experience. There is no GRE or GMAT requirement. DU offers a graduate tax program online that is offered to students who live more than 50 miles from Denver and who want to advance their skills in the field of taxation. This 30-credit master's of taxation consists of eight core courses that can be completed on either a full- or part-time basis. The curriculum in this online master's in taxation covers a variety of topics, including corporate taxation, individual taxes, tax principles, estate planning, and exempt organizations. Students must maintain a minimum GPA of 2.7 throughout the program and must complete all coursework within five years from admission to graduate. Applicants to this online master's in taxation program must have a bachelor's degree in accounting or a business administration degree with a minimum GPA of 3.0 to be considered. There is no GRE or GMAT requirement. DU is accredited by the Higher Learning Commission. UC Cincinnati offers a MS in taxation that is ideal for tax professionals who want to receive extensive training in a completely online learning environment. The 30-credit program is delivered by the Lindner College of Business, which is accredited by AACSB. This master's in taxation online can be completed in 24 months and includes courses on a variety of topics, such as individual and corporate taxes, S corporations, federal tax research for individuals and businesses, and IRS practice and procedure. Students must also complete a required capstone course, where they demonstrate their mastery of research on tax issues. Graduates enter the workforce well-versed in writing professional research papers on taxation topics. Applicants must have a bachelor's degree and submit official transcripts, GMAT or GRE scores, and a record of effective leadership to be considered. FAU offers a master's of taxation through the School of Accounting that is perfect for tax practitioners who want to enhance their analytical and communication skills and technical competencies. This 30-credit program includes 10 courses specifically designed for specialists working in private industry or for the government. The curriculum includes courses on a variety of topics, such as federal income tax, tax research, corporate taxation, partnership taxation, and estates and trusts. This program can be completed on either a full- or part-time basis and can be used to satisfy CPA licensure education requirements. Applicants to this master's in taxation online must have a bachelor's degree, preferably in accounting or another business topic, with a minimum GPA of 3.0 and submit GRE or GMAT scores to be considered. FAU is accredited by the Southern Association of Colleges and Schools Commission on Colleges. GGU offers an MS in taxation that prepares tax professionals to pursue high-level careers in the field. This program is taught by lawyers and tax practitioners and includes courses on a variety of topics, such as individual tax; C, S, and LLC corporations, estate and gift tax, international tax, California and multi-state tax, and retirement plans. Graduates are able to identify tax issues, understand IRS practice and procedure, and have a solid grasp on the ethics and standards applicable to tax professionals. This program can be completed in two years of full-time study or four years of part-time study. Online courses are delivered asynchronously, allowing students to complete coursework at their own pace. Applicants must have a bachelor's degree with a minimum GPA of 3.0 to be considered. GGU is accredited by the Western Association of Schools and Colleges. An online master's in taxation is the perfect option for those seeking to maximize their earning and growth potential while still enjoying the flexibility of distance learning. Whether a student lives in a rural area and can't easily reach campus or they're spending a year studying abroad, these programs allow them the autonomy to continue to live their life and earn their degree at the same time. Estate and Gift Taxation: This course introduces students to federal tax requirements for gratuitous transfers, both during their client's life and when property transfers take place after their death. A special emphasis is placed on helping students develop strategies that will aid their future clients when encountering these types of taxation. Advanced Auditing: Taxation includes both the preparation of tax forms and the review of those documents for accuracy. Auditing is the art of reviewing tax forms and this class introduces topics beyond basic auditing principles, such as behavioral and ethical concerns. Graduate Tax Externship: Many programs require students to complete an externship to gain real-world experience in all of the topics they've covered throughout the program. In addition to working with a taxation firm, learners must complete a portfolio and seek answers to a common issue within taxation. HOW LONG DOES IT TAKE TO GET AN ONLINE MASTER'S IN TAXATION? There are a variety of factors that can affect the length of a program, including the length of a semester, externship or thesis requirements, and whether courses are delivered synchronously or asynchronously. Asynchronous courses allow students to complete coursework at their own pace, while synchronous programs sort students into cohorts and require them to move through all coursework together. Online master's in taxation programs build upon foundational knowledge gained at the undergraduate level. Therefore, students whose bachelor's degree is not in a related subject may have to complete prerequisite classes in topics such as cost accounting, financial reporting, auditing, and federal taxation. The majority of online master's in taxation programs require approximately 36 credits, with accelerated formats allowing students to graduate in just 15 months and traditional programs requiring roughly 24 months of study. Certified Public Accountant: This license is offered by state boards of accountancy and requires candidates to complete at least 150 hours of coursework, meet experience and good character requirements, and pass the Uniform CPA Examination. Employee Benefits Law Certificate: This optional certification covers topics ranging from deferred compensation to pension plans and helps those who successfully complete the program address nuanced questions about employee benefits. Coursework includes the study of executive compensation, health and welfare plans, qualified retirement plans, and benefits. This certificate can be completed in two years of part-time study. Estate Planning Certificate: This certificate is ideal for those who want to develop a better understanding of tax law, charitable giving, and estate planning. The program emphasizes how complex many estates are that are encountered by tax planners. Students must complete two semesters of coursework in areas like income taxation of trusts, estate and gift tax, transfer tax, and private wealth planning. When searching for the right online master's in taxation program for you, the first things you should look at is whether or not the program is accredited. Universities can apply for both national and regional accreditation. Regional accreditation is highly coveted and can take years to achieve, requiring schools to go through a rigorous set of steps to become approved. On the other hand, national accreditation is easier to attain and maintain, although it may make it difficult for students to transfer credits to other institutions or seek professional licensure. The other common type of accreditation is awarded to individual programs or degree paths. Within accounting and taxation, the two main accrediting agencies are the National Association of State Boards of Accountancy and the Association to Advance Collegiate Schools of Business. The U.S. Department of Education (ED) and the Council for Higher Education Accreditation (CHEA) are both tasked with maintaining transparency and high standards among the nation's accrediting agencies. Students can see a full list of accredited schools by visiting the ED and CHEA websites. A bachelor's degree in accounting and taxation opens the door to a variety of entry-level roles, while most advanced positions in management require an online master's in taxation. According to data supplied by Georgetown University's Center on Education and the Workforce (CEW), salaries for individuals with advanced degrees in accounting or taxation were nearly 32% higher than those of their colleagues with only bachelor's degrees. Master's in taxation graduates can pursue several different career paths after graduation, all of which command higher-than-average salaries and significant opportunities for growth. The majority of these roles offer a stable 40-hour work week, but there are also several freelance and consultant roles available for the more entrepreneurial-minded. Auditors work with clients, either individuals or companies, to examine financial statements, inspect accounting records and systems to ensure that they comply with taxation laws, and write reports about the validity of existing tax records. Budget analysts work with both private and public companies to review budget proposals, make recommendations for funding requests, monitor internal and external spending, estimate financial needs, and create overarching budgets. Economists focus on the big picture. They are responsible for analyzing economic trends, collecting data, conducting research, interpreting market trends, and creating reports about their findings. They may also serve as consultants to businesses or corporations who are seeking expertise on specific economic issues. These professionals are qualified to provide sound investment and financial advice and guidance to individuals and companies. Financial analysts may recommend investments, evaluate financial data, review trends, or prepare written reports about their investment projections. Financial managers can be found working as either consultants or as in-house counsel at large corporations. They oversee the monetary health of their client and are responsible for preparing forecasts and financial statements, monitoring legal requirements, reviewing financial records, and analyzing market trends. Founded in 1916, the AAA is the premier community for accountants in academia. Members have access to cutting-edge research, publications, annual meetings, and a variety of other continuing education opportunities. The NATP serves tax professionals by providing them with tax education, local chapters, frequent webinars, regular publications, and a range of education offerings. The NABA serves more than 200,000 people of color working in professional accounting and taxation roles. This organization offers a variety of services exclusively to members, including education and development opportunities, scholarships, networking events, and an active job board. With the average annual cost of attending graduate school at $30,000 for public schools and $40,000 for private schools, completing an advanced degree can be a difficult financial decision. Fortunately, there are several ways for students to help fund their education. All students should start by filling out the Free Application for Federal Student Aid (FAFSA) to find out about federal scholarships, loans, grants, or work-study funds. If you plan to work for a nonprofit, you may also qualify for the federal government's Public Service Loan Forgiveness program. Students can also find financial aid through private foundations, accounting associations, nonprofits, and individual schools and departments.